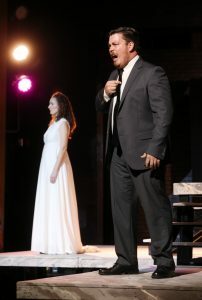 Activities of the Guild include hosting receptions, providing greeters for opera theatre performances, and organizing events to showcase opera and student singers while providing support for UA’s opera theatre program in the School of Music. The Guild’s annual GALA is among the major fund raiser for the opera program and generates nearly 75% of the program’s annual operating budget. We welcome new members, so if you or someone you know would be interested please contact Guild President Atta El-Kaddah by e-mail at battoota@comcast.net. You may also contact the Immediate Past President Francine Marasco at Francine44@aol.com or by calling 205-310-2348. Guild meetings are held monthly with interim communication by e-mail, telephone, and personal contact. Visit the Guild’s website at www.uaoperguild.org for updated information and events. From Mark Adamo’s one-act opera Avow, part of the production “Cards and Letters,” Fall 2017.